Ninagawa Macbeth is a cultural twist on the classic Shakespearian play Macbeth. You are taken back to 16th century samurai Japan. To many the mere thought of watching a theatre production that is solely spoken in Japanese is daunting; obviously to those that do not speak any Japanese it is unsettling, but as the production begins the language barrier seems to no longer exist you are fully immersed within the world created on stage and every single word is spoken with such emotion that even those that do not fully understand the Elizabethan language subtitled still seemed to be completely engrossed within the Japanese performance. The first outstanding thing that can be seen is the incredibly intricate set design; each branch of the traditional Japanese cherry blossom tree was handcrafted with care and individuality. Every detail of each carving was individual, the intricacy was exquisite on every set design; this is just a simple insight into what you will be experiencing for the next 3 hours of this production. As the house lights go down and the stage lights increase in intensity, there is a build up of anticipation from the audience members, nobody knows what to expect, but I can assure you that it will exceed expectations as I was certainly sceptical before the production started. Every single actor portrayed their character exceptionally well; especially lady Macbeth who had a way of changing her tone and a way of skilfully controlling her body to manipulate not only Macbeth but it also manipulated the audience and the feelings towards her as a character. Throughout the production, it becomes quite emotional, due to Japanese culture, they react very differently than the British culture; this therefore can bring up some very raw emotions within the audience. The whole production is full of tension that could be cut by a knife but it’s easily broken using humour, when it seemed like the production was getting too serious and there was too much tension in the audience, a light hearted joke from a character was happily accepted by audience members. It all built to one scene- the fight scene. The fast paced choreography with contact made with each possibility made it energetic, dramatic and believable. 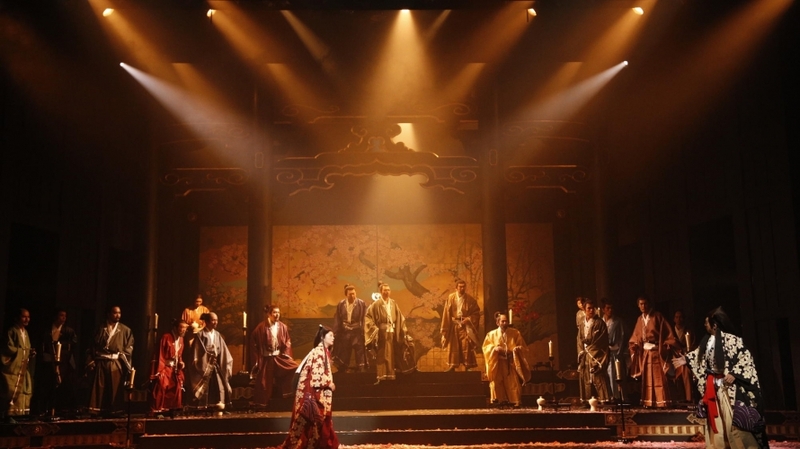 Ninagawa Macbeth has a lot to offer to the audience, the merging of traditional Japanese theatre with a classic British play creates a new sense of diversity and culture, but along with this cultural diversity comes the issue of very few people knowing Japanese fluently. The production company tackled this issue by displaying English subtitles on either side of the stage, while this was extremely useful it also gave the audience members a lot to take in while having to read and understand Elizabethan language while also keeping track of the characters on the stage and the set and character changes. Overall, the cultural diversity of this performance is a breath of fresh air within the theatre world, even though you may be sceptical at first and it may be slightly confusing for the first few minutes, it will be worth it and will almost always receive a standing ovation.